Our experienced therapy team is committed to providing outstanding results and excellent quality care. Patients are empowered through individualized programs to reach goals that will increase their independence and ability. Our team also encourages families and caregivers to participate in therapy sessions, caregiver education, patient, and training. Our experienced physical therapy team provides each patient with a comprehensive evaluation that allows them to create an individualized treatment plan that helps each patient return home active with increased muscle strength and endurance. Patients receive daily private one-on-one therapy sessions to help them improve upon their balance and coordination following a major surgery, injury or illness. 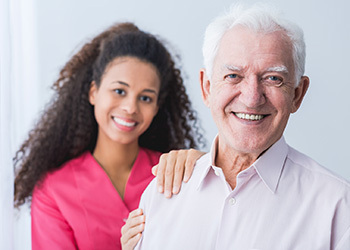 Our experienced team of occupational therapists use task-oriented activities to help patients re-gain their functional abilities that have become impaired due to illness, injury or aging. Each patient has an individualized occupational therapy plan that is designed to help each patient adapt to their social and physical environment by mastering tasks essential for daily living. Our occupational therapists may work with patients who have debilitating arthritic conditions or those with difficulty bathing, dressing and other activities of daily living. They assist residents with impaired vision and/or hearing to function at their highest level. Our speech-language pathology team can provide diagnostic and therapeutic speech therapy services. Our Speech-Language Pathologists are certified to provide VitalStim and Deep Pharyngeal Neuromuscular Stimulation therapy. VitalStim therapy is a non-invasive, external electrical stimulation therapy that re-educates the throat muscles needed for swallowing. Therapists are also certified to complete Deep Pharyngeal Neuromuscular Stimulation (DPNS), which uses stimulation to cranial nerves to improve muscle strength and reflexes used for swallowing. Each Speech-Language Pathologist creates a patient specific treatment plan that is designed to maximize the patient’s cognitive, communicative and swallowing abilities.